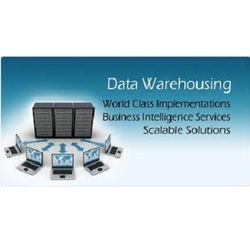 By understanding the demands of our patrons in the best possible way, we are increasingly engrossed in offering Data Warehousing Consultancy Services to our clients. Delivered in tune with the standards defined by the industry, these services are enormously in demand. Due to their cost effectiveness, these provided services are hugely treasured. In computing, a data warehouse (DW or DWH), also known as an enterprise data warehouse (EDW), is a system used for reporting and data analysis, and is considered a core component of business intelligence. DWs are central repositories of integrated data from one or more disparate sources. We provide Real Time & Practical Hands-on Data Warehousing training. Join us to shape your career in Data Warehousing (DWH). This course provides the basic and advanced skills for developers. Today the data warehouse is becoming a strategic corporate initiative supporting an entire enterprise across a multitude of business applications. The brisk pace of change, coupled with industry consolidation and mounting regulatory requirements, demands that data warehouses step into a mission critical, operational role.